DIN 3869 profile sealing rings are used for the axial-static sealing of threaded tube connections, fittings and sealing screws with stud ends in connection with ports. By tightening the screw connection the easy-to-handle elastomer profile sealing ring is compacted, thereby producing the sealing effect at the surfaces to be sealed. The purpose of the profile sealing ring is to stop the medium from leaking, thereby preventing loss of pressure. The geometry protects the seal against twisting during installation and in the installation housing. 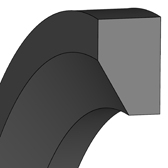 At the same time, the profile sealing ring holds back dust and dirt. 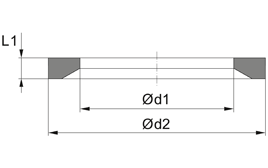 Any mechanical deformation of the cross-section is minimised due to the geometry of the profile.